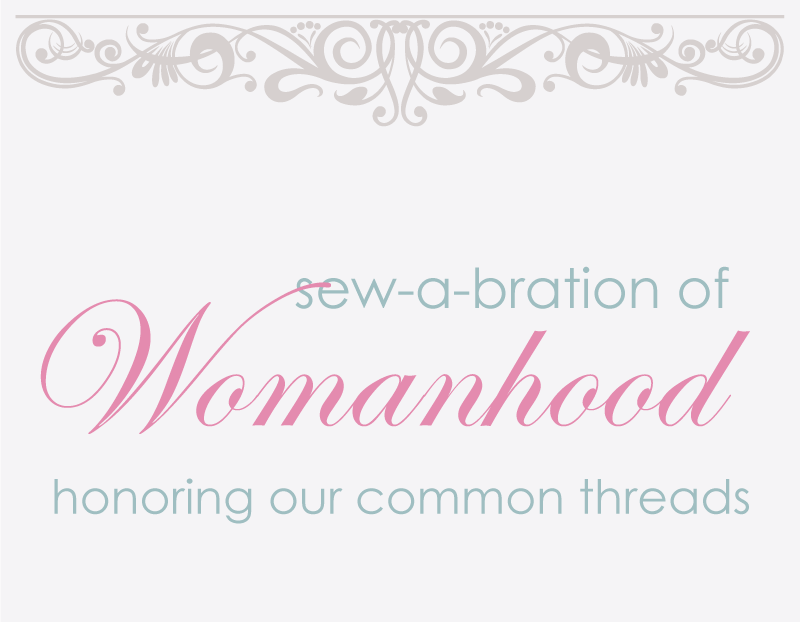 We’re nearing the half-way point in our Sew-a-bration of Womanhood, so I thought it would be a great time to show you some things I’ve been sewing for myself. I am struggling with getting some good clear photos of myself so please excuse the terrible pictures and if you have any tips about how to get things more in focus while using a timer I’d love to hear them! The top is the Trifecta Top from Kitschy Coo. It’s for sure my favorite new tee pattern. It’s a raglan shape with v-neck and scoop neck options as well as some fun shoulder, pocket, and inset triangle neckline details to try. As I was really trying to get the fit right this time (I made one muslin that was a little too big) I stuck to just a simple v-neck. The way Amanda has you do the v-neck is the easiest I’ve tried and I’ve done a few different ways before. This neck band went in so smoothly. I’ve found that lately when sewing a top for myself that using my high bust measurement (under the armpit) to find the right size to sew works best. That usually means I need to do a full bust adjustment (fba), but it’s worth it to have the neckline and shoulders sit correctly on my frame. The best part about this top is that the instructions tell you to use the high bust measurement to find the right size and Amanda has accounted for negative ease across the chest in the pattern pieces already so an fba for my shape was unnecessary. That makes things super easy. Oh, and wait the best part is that my high bust measurement put me in the size 5 (Kitschy Coo has it’s own sizing standard based on 1 being the smallest) which meant I could cut on the super cool “kitschy coo” cutting line. It’s ridiculous how happy that made me while taping the pattern pieces together. 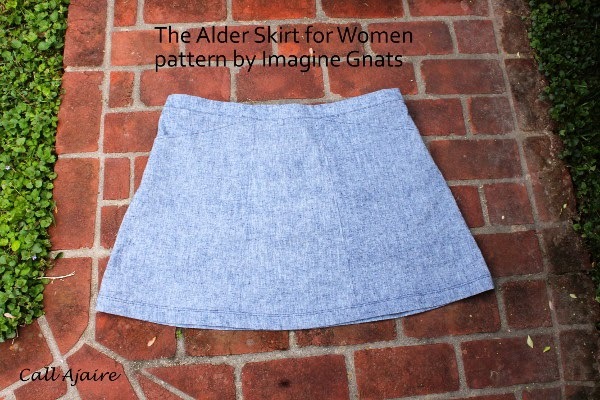 The skirt pattern is the just released today Alder Skirt for Women by Imagine Gnats. 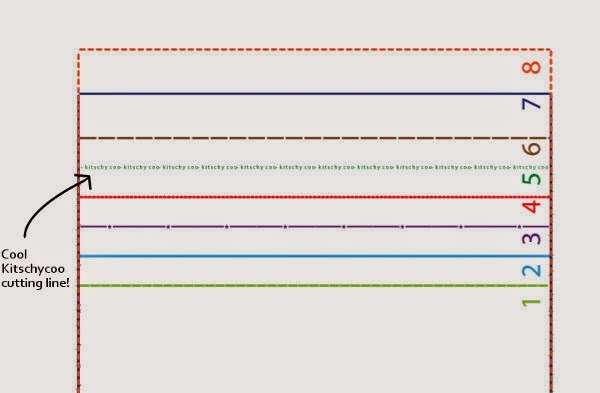 I tested this pattern and it was nearly perfect even in the early stages. 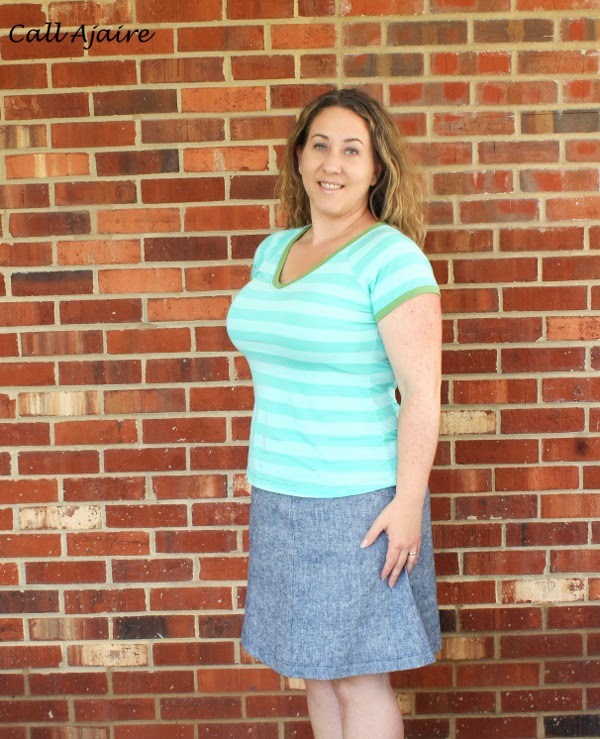 There is a great option for a pleat in the center front and oversized pockets which I love. It makes this a-line skirt unique and fun to wear. The skirt is designed to sit right above the hips which is where I always wear my skirts anyway. It has a flat front waistband and darts with a bit of elastic in the waistband in the back. That means there are no closures, but the skirt maintains a nice shape without being all bunchy from a completely elastic waistband. For this skirt I chose the plain front (no pleat) and the flat pockets because I wanted to see what those options looked like. I love the fit and feel of this skirt and now I can’t decide if I like the plain front or pleated front better. I’ll just have to make a few more versions before I make the final decision, hehe. 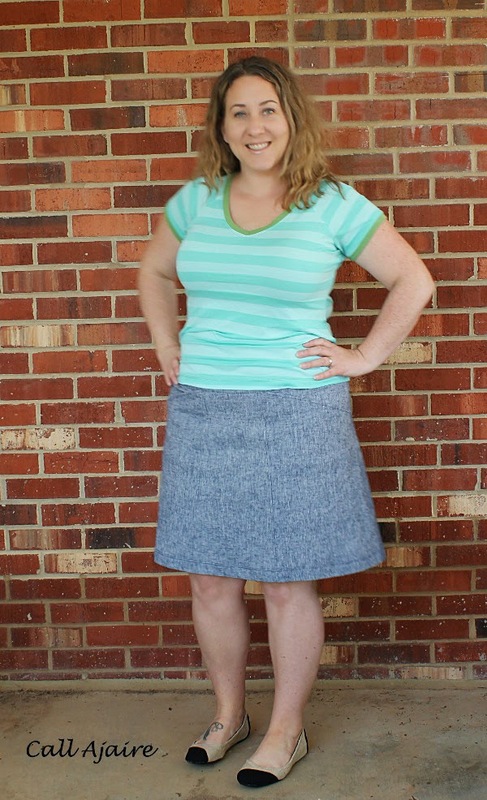 The skirt is made with one of Imagine Gnats’ new chambrays. This is the chambray stretch linen in indigo and it’s so lovely in person. One of the things I mentioned when we first kicked off this series is that it’s hard to justify taking the time to sew for myself when even just getting the muslin and fit right takes longer than it does to make a couple of things for Bean. I’m trying to make sure that I still do continue to sew for myself and patterns like these two, designed by women who have spent their valuable time to ensure that fit issues and adjustments – even on a difficult to fit body shape like mine – are minimal once the pattern is in our hands, are the key for me. So I give a big thank you to all you independent designers who tackle the challenges of the “normal” woman’s frame, hold our hands along the way with great detail on how to make any adjustments that are necessary, and give us lovely design options in the process. Most of us couldn’t do it without you! Your outfit is fabulous! I love the colors you used for your knit Trifecta top. And the Alder Skirt with a flat front and pockets in one fabric look great too. Great outfit! For timed pictures of myself, assuming you have a DSLR, this is what I do. I'll take an object like a lamp and put it where I'm going to stand (depth of field about 3.5 to 4). I take a picture and let autofocus do its thing. Then, I put the camera on manual focus. I mark where the object was and make sure I stand right there for my pictures. It actually works really well! LOVE LOVE LOVE that! May be time for me to do some "selfish sewing"
Jessica thank you for the tip! I opened it a bit, but not enough so I will definitely try that. I have heard a similar tip before raphaelle and I don't know why I didn't try it. I will definitely try it now! Your pictures of yourself always look great! Thanks Meghan! I was determined not to worry too much about lining up the stripes this time and of course they worked out better than normal haha. Go figure. These patterns fit you perfectly! especially love the skirt. Great outfit! Love the knit of the shirt! Aw, thank you! Another thing I do is get the husband to take pictures. I think I just recently figured out how to get him to do it right. He doesn't see distracting things in the background so now, I take a few pictures of him. He's just a stand in to have an idea of how a person fills the frame and what parts of the background are visible. Once we've chosen a background and I've set the camera how I want, I let him take pictures. All that's left for him to do is look at me and help me pose. This is an outfit I would wear every day. I love the striped shirt and the fit is just perfect! And the skirt is so simple yet so cute! I'm intrigued by the fit on the trifecta top – she seems to have so much knowledge on fitting knits! You look great! Cute!! I still can't manage the timer/tripod thing… By the time I want/need photos, I'm in no frame of mind to be patient and LEARN things. You still look great, though! !